William Rogers, son of William and Sarah Rogers, was born on July 22, 1751, in Newport, Rhode Island. He was academically prepared for college at the age of fourteen, and thus in 1765 acquired some notoriety for being the first and for a time the only student of Rhode Island College, now Brown University. After receiving an A.B. from that college in 1769 and an A.M. in 1772, Rogers became principal of an academy in Newport. Rogers was ultimately granted four honorary degrees: honorary master’s degrees from the College of Philadelphia (now the University of Pennsylvania, in 1773), from Yale (in 1780) and from the College of New Jersey (now Princeton, in 1786) and an honorary Doctor of Divinity from the College of Philadelphia (in 1790). He also served as professor of oratory and the English language at the College of Philadelphia and then, after the 1791 union of the College of Philadelphia and the University of the State of Pennsylvania, at the University of Pennsylvania from 1789 to 1811. From 1771 to 1824, Rogers was a Baptist clergyman, serving as pastor of the First Baptist Church of Philadelphia from 1772 to 1775. His resignation from this post in 1775 left a five and a half year vacancy, although he preached on occasion during those years. 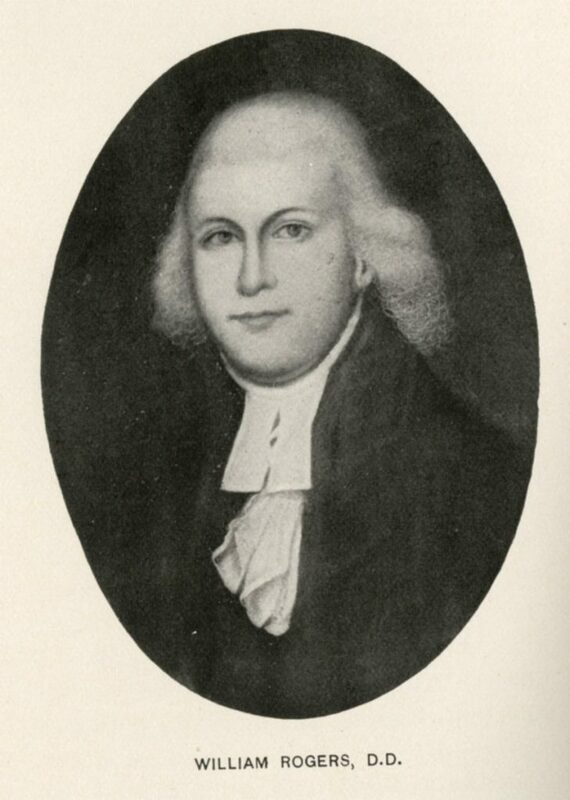 In April of 1776, Rogers became chaplain to Colonel Samuel Miles’ Pennsylvania Rifle Regiment, a position he filled until 1778, when he was appointed a brigade chaplain in the Continental Army. He retired from this second position in 1781 and, although he had opportunities to enter upon other pastorates, there is no evidence that he served in that function again. Rogers held various offices in literary and religious societies. In 1783, he became one of the original members of the Society of Cincinnati. He was chaplain to the Military Legion of Philadelphia in 1805; in 1816 he was sent to the Pennsylvania legislature; and in 1819, he became a member of the Religious Historical Society of Philadelphia. Rogers was known as a writer of moral, religious, and political articles. He died in Philadelphia on April 7, 1824. His family consisted of three daughters, one of whom married William Henry De Wolf of Briston, Rhode Island.